Welcome to the “SEO chasing Google” algorithm game. After 4 algorithm updates in less than 2 weeks, the incumbent, Google, has left the SEO industry puzzled. In contrast to the first few panda/penguin updates where Google provided detailed information for each change, these new updates were all linked to past Google blog posts, without much insights. However, Google has been quietly updating their content guidelines at the same time that new algorithms are rolling out. 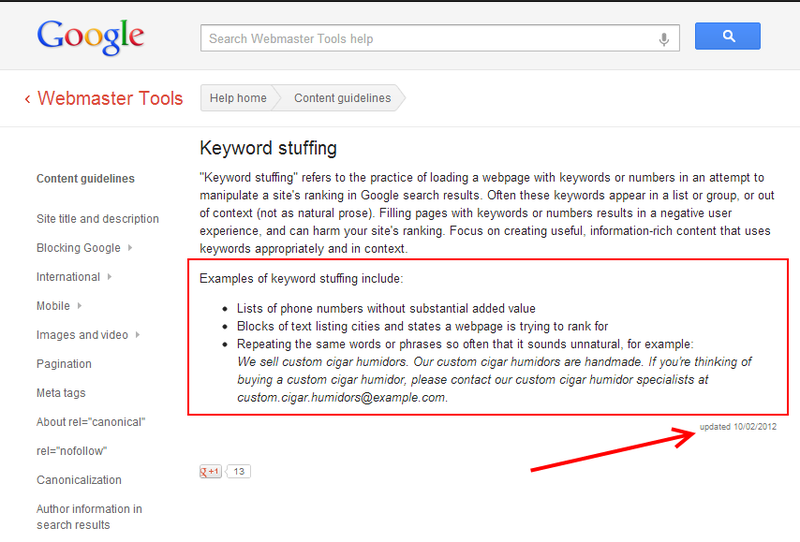 The latest one we found is a quick update to their “Keyword Stuffing” guideline on October 3, 2012 right before Penguin Update 3 on Oct. 5, 2012. Here are the new updates that were only anecdotal before, but are now all part of Googles Webmaster Guideline, so it is fair to assume they are programmed into the algorithm now.